These five steps in a DMAIC project represent a structured roadmap used to improve existing processes. DMAIC projects strive to reduce variation and improve performance about a target. Each project should follow this general roadmap to completion. Within each (CLICK on a phase) of the five phases is more detail about the tools and the outputs that each will provide. A project begins with defining the problem. Each process phase should undergo a gate review before proceeding to the next. A gate review validates the applicable outputs are complete and prepared for the next phase. These reviews are done with the coach, sponsor, Green Belt, or Black Belt, Master Black Belt, and possibly a steering committee or upper management. Don't panic because you can't use all the tools or you don't think there's enough time to use all of them. Each project uses different tools and none will use all of them. All the tools are there to use if needed (like a toolbox); don't spend valuable time forcing the use of a tool when it isn't applicable. Each project is unique and the tools used will vary from project to project. There is not a specified amount of time that each phase needs to be completed. Each project will vary on the amount of time spent within each phase. Some tools are used in more than one phase and on more than one occasion. For example, Pareto diagrams can be applied in every phase and multiple times in a phase. The tools listed are not listed in exact chronological order or in order of importance as both may vary between projects. Within each phase are visual aids of the roadmap showing the typical inputs and outputs expected. Clicking on the phases above will lead further into tutorials and materials on each topic. These are simplified lessons that are adequate for most projects. Not all topics for a Six Sigma/Lean program are shown as they are virtually infinite and evolving. There are >100 sample certification problems from each section to help you practice the key focal points of the DMAIC cycle. Click here. 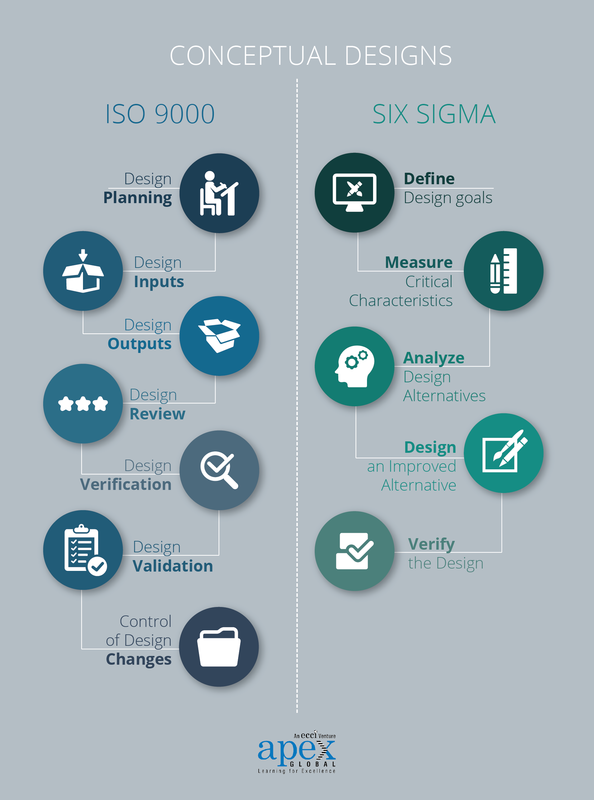 Click here to learn more about the types of DMAIC Six Sigma certifications and types of options that are offered by our affiliate. 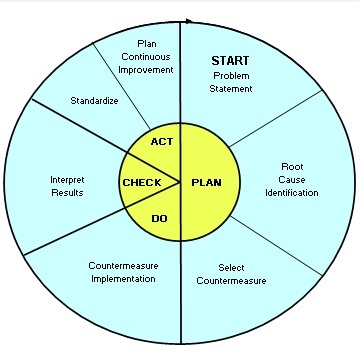 The DMAIC cycle is similar to the PDCA cycle. Dr. Deming put this tools into widespread use but is commonly referred to as the Shewhart cycle. Sometimes it is referred to as the PDSA ("Study" rather than "Check") to put more emphasis on analysis which is analogous to the DMAIC - ANALYZE phase. The one more point that can't be emphasized enough is the need to put robust controls in place that SUSTAIN (CONTROL phase) the gains after the ACT part of the PDCA cycle. The PDCA cycle is found within the A3 problem solving tool that has grown in popularity due to its single sheet of paper (size A3) format using simple tools to solve problems. 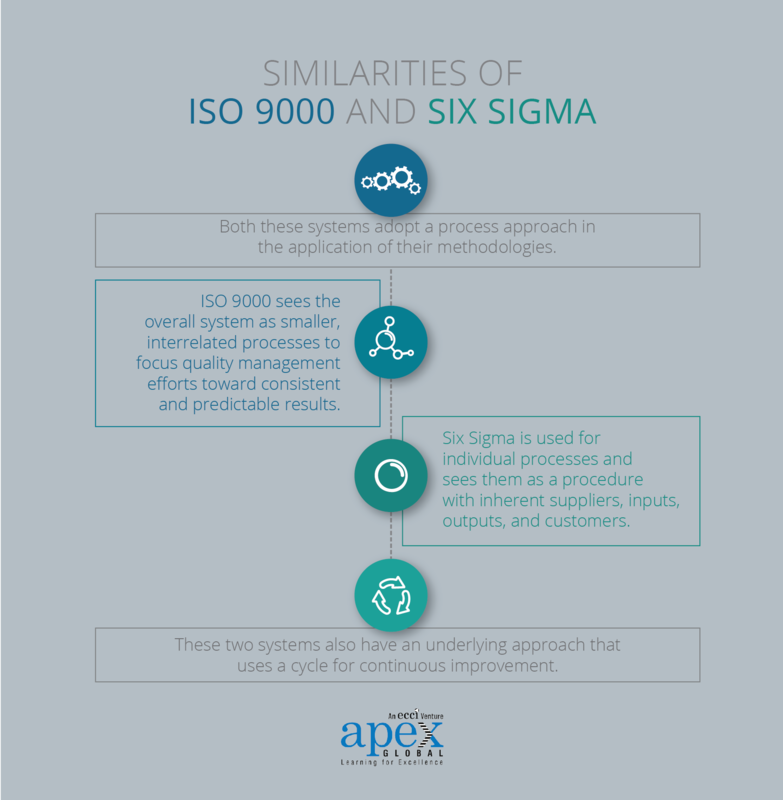 ISO 9000 and Six Sigma have similarities and differences. Click here to read a detailed explanation on each program. Shown below are a couple basic visual aids. This article does a good job explaining the basis for each program.